Club Ride, from Idaho in the US, makes 'cycling-inspired lifestyle-performance clothing' and its Wheel Cute Women's Jersey is certainly that. The bicycle wheel pattern is a dead giveaway for the first claim, and several features substantiate the second. The polyester/rayon mix fabric feels super-soft against the skin, and is very lightweight so you hardly feel you're wearing anything. It wicks well and dries quickly – I wear it with a backpack and the material copes very well with a sweaty back. The fabric also affords sun protection with a UV protection rating of 20. Then there are the reflective details: the CR logo below the collar on the back, and the Club Ride tag sewn into the side seam. These are only little but they are something to catch the eye on an overcast day or if you're caught out at dusk. Being an American brand, though, all its clothing is designed for riders being on the right-hand side of the road, so the reflective accents are on the wearer's left. Handy if you're popping to Europe for a riding holiday, though. As for appearance, the cut of this tee is flatteringly feminine, with ruching at the sides to give it some shape and help it follow your curves. That said, it's a loose fit – I sized down to a Small from the Medium photographed, and even that is still a relaxed fit. It's a decent length, too, so you don't expose your lower back when leaning forward over the bar. It comes in three colours: steel (pictured), olive and ivory, so nothing bright to scare the horses, should you bump into any on your excursions. It's a top I'd happily wear to the pub or even in the office after commuting in, plus the price is competitive. So, Club Ride, I'd say your mission is accomplished. 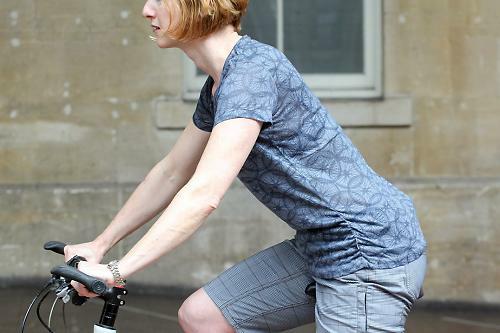 Club Ride designs clothes that perform well technically and also look stylish so you can wear them out after your ride without needing to get changed. 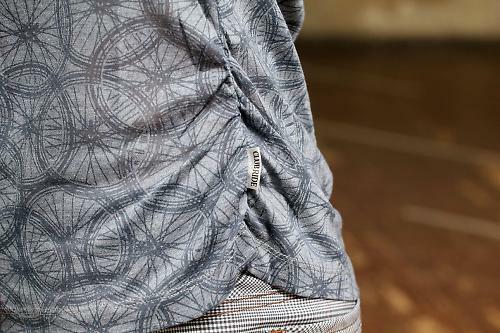 This tee fits that bill – it both looks good and works well as a wicking riding top. The material is quite fine so you wouldn't want to snag it on Velcro, for example. There was very slight bobbling under the armpits and where my backpack rubbed, not that you'd notice without scrutiny. Worked great as a wicking base layer, and very comfy fabric against the skin. The design, pattern and feel of the fabric.